Before we decided to get Oscar, we didn’t consider mini pig sleeping habits and whether a mini pig would be a good fit for such an important part of our lives. We prefer a quiet house and value our sleep, so it’s important that we have pets who sleep quietly through the night. On the way home from picking Oscar up for the first time, I realized I hadn’t even considered if mini pigs slept through the night, if they were loud sleepers, or how much they slept in general. Of course I expected some sleepless nights while Oscar was really young and was potty training, but I hoped after that he would sleep quietly and not keep us up a lot throughout the night. I have been pleasantly surprised by Oscar’s sleeping habits! Aside from the first few nights when Oscar needed to go outside in the middle of the night, he sleeps quietly until morning. What’s even better is that Oscar sleeps in! When Oscar was really young, I woke him up first thing in the morning to take him outside, and I learned that he hated being woken up. I started letting him sleep for a while longer, and now he just lets me know when he’s ready to get up. In fact, I usually get up a few hours before Oscar and get some chores in before he’s awake, giving me more time to focus on him once he’s ready to start the day. On a normal day, Oscar goes to sleep a little after 8 pm on someone’s lap and then moves to his crate when it’s time for bed. He goes immediately back to sleep and then gets up around 8 in the morning. He has started napping more throughout the day, but when we first brought him home he avoided napping as much as possible. My guess is that he’ll continue to nap more as he gets older. Although we didn’t initially consider how a mini pig’s sleeping habits would fit in with our lives, I have zero complaints. Oscar sleeps longer and quieter than our dog, and aside from the faintest, cutest little snore, he doesn’t make any noise while he sleeps. He sure is a noisy little guy during the day, but he is a champion sleeper! Update: While Oscar still sleeps quietly throughout the night, he no longer sleeps in and is up and ready for breakfast most days by 6:30 am. Read more about his new waking time in this post. We just got our baby mini pig yesterday. She (Isabelle) of course wants to be held all the time. Her crate is in my daughters room (it’s her pig, she is 15) and she didn’t get much sleep at all. I learned this morning that my daughter fed her during sleeping hours so that she would stop squealing and so that she could get some sleep. What are your recommendations for sleeping arrangements? My daughter wanted Isabelle to sleep with her, but we are in the process of potty training. Also, should the litter box be in her crate? It seems as though every time I put her in her litter box, she does go, but should I have her on a time schedule for that? She seems to go alot. Thanks in advance. Thank you for your quick response and advice. We did move her into the bathroom and she seems very content in there. With my daughter at school and us working, that’s where she will stay until she is completely potty trained and I am comfortable letting her roam the house when we’re not home (if that’s advisable). My poor little Isabelle has gotten diahrrea though and I am concerned. The breeder said that she is probably just stressed. They said to feed her a 1/2 cup whole milk and Cheerios twice a day, but she is not even eating the Cheerios. She is just drinking the milk so is she getting enough food then? They also said that I could give her plain yogurt but she didn’t seem too interested in that either. Not taking any vegetable treats yet either. She is playful and loving and doesn’t act sick so it’s just the diahrrea and her only drinking the milk that’s a concern right now. Do you have any suggestions on that? Thank you in advance. I’m glad the bathroom area is working well for her. They seem to like having a little space of their own. I hope she gets to feeling better soon! I unfortunately don’t have any good suggestions for that since we haven’t dealt with it. She probably is just stressed, but I would probably take her to the vet just in case. They can be fragile still at that young age, and it could be worth just making sure everything is okay. Hope she’s back to eating and feeling well again soon! How old is Isabelle? Mine (biscuit) was 4 weeks when I got her it was too early. I feed her goats milk half and half water. Also oatmeal with goats milk never any problem what is giving her problems is whole milk. And he gets cranky and fussy if he can’t cuddle & pass out. He also HATES water- I’m working on this. Hi! I discovered your blog while researching the idea of getting a mini juliana pig, and I love all the information! My husband and I recently built a home on 3 1/2 acres, and we have 2 small children and a cat. I met a lady who owned a pig, and was intrigued over the idea of adding a pig to our new home. I read your post about the cons of owning a mini pig, and I think they all seem like obstacles that could be overcome. My only concern is that we work full time during the week, and the kids are in school. So we leave the house at 7:30am and return about 5:45pm. It seems like such a long time to leave any animal (except the cat who loves the peace and quiet! ), and I would worry about the pig being lonely. I’ve read a lot about them getting bored, and then destructive. We do have enough room to build a pen outside or even put a large crate in the garage, but I’m just not sure if that is fair to the animal. Our family has the same issue with working full time and it is a great concern. We just got our little bundle of joy this week. I am hoping that in time, my dog (who is a 7 year old silky terrier) and Isabelle, can keep one another company when we are gone. One thing for sure, our little Isabelle has brought us so much joy within these last few days. She is most certainly good for the soul. Thanks for adding that, Gina! I don’t have direct experience with being away from home during the day while having a mini pig, so I appreciate you responding. Would love to hear how things are going once you get more settled with Isabelle since a lot of people are curious about what life is like with a mini pig while working full time outside the home. Most certainly! I have thoroughly enjoyed reading your experiences with Oscar and it has helped me greatly! Thank you so much! I have a 11 month old Teacup mini Jullian pig named Arnold .I got him at 10 weeks and have had no problems with feeding him mini pig chow and Rachel Ray Nutrish. I just had him to the vet for a check and and to get nutered. He is 68 lbs and no health issues except for dry skin. A few things I can recommend is giving your piggy a place of his own. Arnold shares a bedroom with my Cocatoo and they get along fine. Arnold has blankets on the floor he roots in and sleeps on I also have a “Buzy Box” for him to play in during the day. I used a liter box and put old pill bottles in it some stones from outside some whole nuts and balls and squeeky toys. He has a liter box in there he uses in emergencies but prefers to go out when I get home. You can not let your piggy have free roam of the house when you are not home . They are courious and like to chew on cords knock over house plants try to open cupboard doors and will even open the fridge if they learn that is where the food is. They are very smart and Stubborn too Treats work better then force for sure. What are you going to do with him when he weighs in at 250 lbs? I would NEVER leave my pig and my dog unattended. No matter the size of the dog. It’s honestly dangerous. Pigs are stubborn and don’t know when to quit. When your pig is big, he or she can easily injure a small dog and in some cases kill it. If your dog is bigger, they can easily kill your pig. Pigs have no real way of defending themselves against larger dogs, other than to run… and they can’t get away from a dog in the house. I saw a horrible case where a lab ripped the jaw off off of a pig :/ please, don’t risk it. I don’t think it’s a good idea to leave any large dog with any small dog or animal for to long – you just never know. We just got one and everything i have researched has lead me to your site. Thank you for posting all these things for newbies like myself. You’re so welcome! Hope things are going well with your new pig. Thanks for taking the time to write such a nice note! I just got a baby pig and she doesn’t like to sleep in the cage, she squeals… And she can’t sleep on my bed because she might jump down…last night I had to make a pallet on the floor and sleep, but she woke me up 10 times and I’m really tired. When did Oscar start to feel comfortable sleeping at night? Hey we just got a mini pig and am having trouble litter training it. Im not a member of this site or know how to sign up but maybe you could email me? I can give you more info on our situation too. tsemski@gmail.com is my email. If I may, I hope you don’t mind a suggestion. The first night we brought Isabelle home, we put her in her cage as well. It didn’t go very well either as we got no sleep. My daughter has school and I have work so…. we need sleep lol. We decided to try the bathroom the very next night. It is roomier and it allowed her the feeling of not being caged in. We made sure that there was nothing that she could get into to harm herself such as chords, makeup, etc. The bathroom is now where Isabelle stays when are not home. She has all the necessities such as her litter box, water and bed, plus a few extra blankets. Sometimes someone has to get up in the middle of the night to use the bathroom, and I’ve found it best just to keep quiet and not talk to her when we go in there. She has learned that it is not “awake time.” Needless-to-say, this has worked very well for us. You have a very informational and wonderful site! Thank you! Hello, what a great site, we just bought out first American mini pig. He ( George) has been so sweet to hold but getting to him and picking him up is another story. He seems very skittish but we have only had him for 1 day. We tried giving him a bath in our small mud sink and he was not going to have any of that, so my wife with all her clothing say in our normal bath and we have him a sponge bath and he did good that way. Do you have any advice on picking the up or bath time? Could it be we are just new and he is still a little scared. Thank you for the compliment on the site! Everything you mentioned about George is normal for a mini pig’s first few days (and sometimes weeks or months) at home. It will take a while for him to bond with you and your wife, so keep holding him like you have been to help him settle and learn to trust you both. Here’s a post about bonding with a mini pig that might help: http://lifewithaminipig.com/bonding-with-your-mini-pig/. He eventually will learn to trust you, but it can feel like a long road at first. Oscar and I have a video on How to Hold Your Mini Pig (http://lifewithaminipig.com/how-to-hold-a-mini-pig/) so I recommend checking that out if you haven’t. Even if you hold George “correctly” at first, he will likely squeal and squirm until he’s used to being held which just takes time and practice. Make sure not to put him down if he’s in the middle of a squealing fit (don’t want to teach him that squealing gets him what he wants), and keep at it. Even now, Oscar doesn’t love being picked up; he doesn’t squeal any more but he prefers to make his own decisions about where he’s going. 🙂 The bath is tough. Oscar hates water, so we’ve really struggled with baths. We put one of those rubber mats in the bottom of the tub to keep Oscar’s hooves from slipping and then add just a little water in the tub, and I wash Oscar quickly while my husband distracts Oscar with peanut butter on a spoon. It’s pretty ridiculous, but it’s been working for us. Hope that helps! So we just had our first vet visit and everything checked out great very healthy and not over weight…George had his first vaccination and is not super unsocial does not really want to eat and is just saying in his little house. Do they get sick from the shot? It just seems like he really just wants to be left alone. Any thoughts? was thinking about calling the vet tomorrow…. I’m glad everything checked out well with George at the vet today. We actually never had Oscar vaccinated since he’s not around other pigs, but a lot of pig parents do. So, unfortunately, I don’t have any experience with that to help out. However, maybe another pig parent will see your comment and can respond if their pig also had a response like that to a vaccination. Either way, I would definitely call the vet tomorrow just to ask and make sure it’s a normal reaction and not something that needs attention, especially since George doesn’t really want to eat. Hope George is feeling back to normal soon! Cheerios helped us too, but Elliot really isn’t liking it. I don’t think he’s going to come around! Hello! I love your blog!!! I have never care much about pets!!! Dog , cats ect.. We have had them before but nit really into them but OMG! Last week i got a 4 wk old juliana pig !!!! And im in love with him❤️❤️❤️ My concern is this: What color and what texture should his feces be like????? When we got him he was pooping small blackish pieces!! Now it has turn into long and sometimes like a long feces made up with little balls!! Its a little beige kind of color we are feeding him goat milk, oatmeal, water…. Thank you in advance. Thanks for your kind comments about the site! Your question is one I’m not an expert on, so I recommend checking with your vet. With Oscar, some of the changes in shape seem to depend on how hydrated he is. What I can tell you is that the beige color is not consistent with our experience, and my guess is it’s due to the diet you mentioned. Oscar was 5 weeks old when he came home and has been on Mazuri Mini Pig pellets since then, which we’ve been happy with so far. I’m definitely not a mini pig nutrition expert so maybe your pig’s diet is fine, but I recommend talking to your vet to make sure your piglet is getting all of the nutrition he needs, especially with the bathroom changes. Hi! My sister and I are owners of two mini pot belly pigs Angelica and Paisley Marie. Paisley Marie is my pig and I find that she has a hard time sleeping at night. She’ll sleep and wake up in the middle of the night and start fussing. Well tonight I decide to let Angelica sleep with her after she started fussing. Anything I can do to make sure she doesn’t wake up in the middle of the night? She doesn’t want to sleep without her sister. Hi I was reading your thread regarding feeding. My Isabelle is going on three months now and she refuses to eat pig feed specifically for them. I have done everything as far as mixing it with vegetables and fruits that are her favorite. I have tried it alone, but she refuses. She does get grains, vegetables and fruit. Is it imperative that she eat pig feed? Or can I continue with what I’ve been giving her. Hi! I was looking into getting a mini pig and have some questions that I was hoping someone could help me with. What would you suggest about sleeping arrangements and where her cage and litter box should be. If I got her a big enough cage would the litter box be okay in it, or should i get a smaller cage with a gate to also put the litter box there. I will also have an outside crate for her to play in, but I want her to sleep inside during the night. I eventually want her to go outside and use the restroom, but should I leave her cage open during the night so she can walk to the back door? In the future will she be able to sleep through the night without any accidents? I also have a 80 pound dog who is super sweet to humans but to big male dogs he hasn’t grown up with he sometimes growls and barks. We also have a chinchilla and a tortoise that my dog is perfectly fine with. Do you think a mini female pig would be okay with them? Thank you in advance! Hi Abbi! 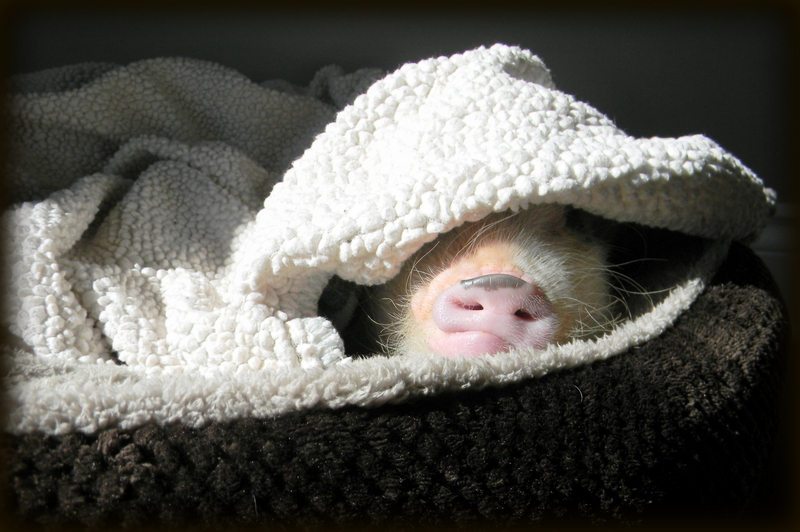 On sleeping arrangements, I recommend either having a mini pig sleep in a crate (which is what Oscar has always done) or in a small gated room, like a bathroom. Since you plan on litter box training, a small gated room might be best so that you can keep everything in the same space. We planned on litter box training Oscar, but he preferred to go outside and since I am home and able to take him out often throughout the day, he never learned to use a litter box. But, one thing I’ve read is that you want to keep the litter box and your pig’s bed a good distance away from each other. Pigs don’t like them too close together and will have trouble if they are, so some space between them is good. I’m not sure if a large crate with the bed and litter box in it would work or if that would still be too close together, but you might be able to find other pig parents who have tried it to see if it worked for them (Instagram is a good place to follow pig accounts and get helpful day-to-day mini pig info). I’m not sure if she will walk to the door on her own when she needs to go to the bathroom, but she might if trained to do so. Eventually, she should be able to sleep through the night without accidents. Oscar did well with that from an early age so you might luck out with that too, but it’s good to keep in mind that, in general, mini pigs don’t have full control of their bladders until they are around 9 months old. On your dog, it’s really hard to say how he’ll react. When we brought Oscar home, we had two dogs. One of them was a large Pit mix and the other a small Boston Terrier. I anticipated our larger dog wouldn’t do well with Oscar and that our smaller dog would be fine, just from past experience with them around other animals. Our Pit mix was nervous and a little afraid of Oscar but ultimately they got along pretty well. They both just minded their own business. With our smaller dog, it’s been a rollercoaster of ups and downs; one day she and Oscar get along and the next day they’re nipping at each other. A lot of dogs tend to be afraid of Oscar at first, but I’ve heard of tons of accounts of dogs and pigs fighting and having potentially scary outcomes. So, it’s really hard to know how they will react together. I think a female would give you better luck since your dog hasn’t done as well with male dogs. Either way, as you probably know, make sure to keep them separated any time you aren’t in the same room with them, which I would say to anyone with pigs and dogs. Pigs have a tendency to instigate arguments but then not be able to defend themselves against a dog. I put our dog in her crate even if I’m just running out to get the mail because I don’t want to take any chances leaving her and Oscar out together. Hi! I’m Hailey! I’m a first time mini pig owner and I loved using your tips to help me with my mini pig! My mini pig is four weeks old and I got him about a week ago! I have noticed him getting slightly more comfortable in my home but I have also noticed that when we first got him he never peed in the house and the breeder never had any problems either but the last couple of days he’s been peeping on my carpet and I don’t know why! Should I just continue the normal potty training method or is there something different I should try?? Hi Hailey! I’m so glad the tips on the blog have been helpful! The first thing I would check with potty problems in a mini pig is to make sure he doesn’t have a UTI. 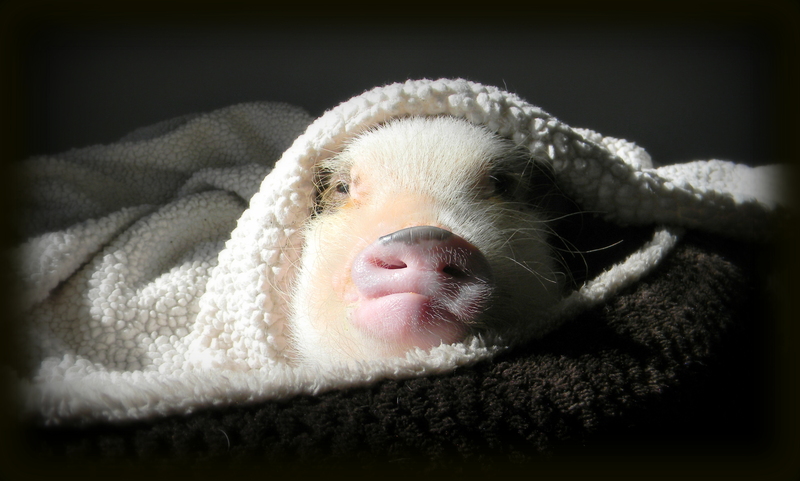 Male mini pigs, in particular, are prone to UTIs. That’s not likely the issue, but it’s always good to check that off the list first. Any time we’ve had potty training issues with Oscar, I basically just start over with his potty training. I make sure I’m getting him out really frequently to at least give him the chance to go so that we don’t take steps backward with his training. If you use a litter box, just take him to the litter box instead of outside of course. One thing to keep in mind, which you might already know, is that mini pigs can’t fully hold their bladder until they are about 9 months old, so if he can’t get outside or to the litter box right when he needs to pee, he might literally not be able to make it to where he’s supposed to go. So, keeping his litter box close or giving him frequent access to outside is important at such a young age. When Oscar was that young, I took him outside about every hour when I could just to give him the chance to go. So, even if yours is going in a litter box, you might just put him in his litter box that often to give him a chance to go. I have/had the same problem with Elliot, now I give him 1/4 cup of water with his food and after. Then outside we go! He goes to his spot and he pees and poops! When we come in he gets romaine or piece of carrot…. watermelon, cheerio. My poor dogs, I can’t leave their water out because Elliot will SYPHEN the whole bowl every time I fill it! It’s like a competition with him. I’m so glad you posted this question and answer! All I read is “make sure they have water ” he was peeing EVERYWHERE and he couldn’t help it. He’s great with outside and wee wee, as long as I don’t give him the whole bowl of water. He even flips the bowl during the day if he wants water! He pees on all my rugs, I don’t use them anymore! Hello! 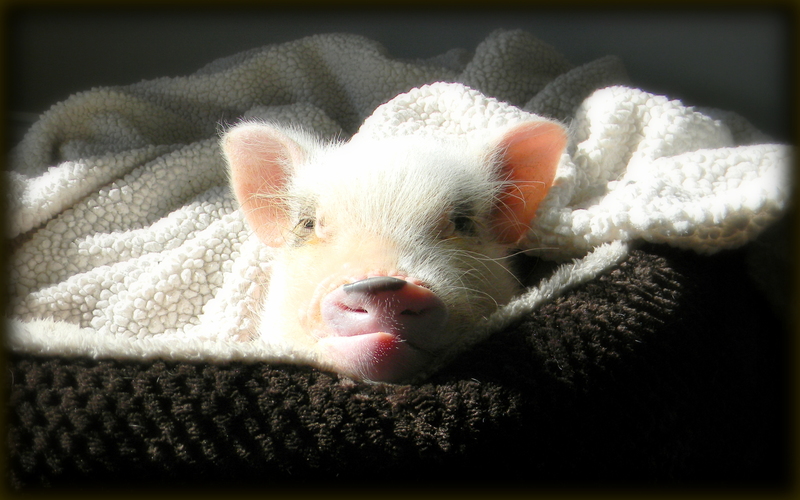 I have a 10 week old piglet and he is an EARLY riser. Getting worse each day, today was 3 am. He runs to his dish expecting breakfast and will have a fit if I don’t feed him. Any suggestions on getting some more sleep? I started a later supper but that didn’t work! Hi Michelle! This is such a tough one and I get a lot of messages with the same issue, so you’re not alone. My full disclosure is we still haven’t 100% figured this out with Oscar, but he’s much better about it than he used to be. Oscar is up around 6 am each day, which is much more reasonable than what you’re dealing with. 3 am is rough so I feel for you! My advice is, as tough as it will be for a while, pick a time to feed him and stick with it. This definitely won’t stop any pre-breakfast squealing for a while, but it might help keep him from pushing the time up for now. Several months ago, Oscar started pushing his time up. He used to get up around 8 am (which was amazing!) and then moved to 7 and then 6 and then 5:30. I realized we were feeding him earlier to get him to be quiet so we could sleep, so I picked 8 am to feed him and stuck with it. He’s welcome to get up at 6 if he wants, but he will just wait. Now he’s up around 6 or 6:30 which is still earlier than I would like on weekends, but it’s consistent and reasonable. It doesn’t mean he isn’t screaming sometimes wanting breakfast, but I just ignore him (I don’t even give him eye contact during that time sometimes…haha). So, I would try picking a time and then ignoring him before then. Of course, if he needs to go out to potty or something, take him but otherwise just don’t react to his screams. You also might try feeding him in an IQ Treat Ball or Bob-a-Lot to make him work for his food once he’s fed. This is such a tough habit to break, and it’s super frustrating. I think this one takes some time, but hopefully he’ll eventually learn to not even try waking up earlier to get breakfast. Spoiled Elliot screams when we don’t pick him up on the couch! It’s so bad, my one dog takes off into his crate! I sometimes let him scream without picking him up, but a few times he flipped over trying to jump up… we realized he just wants to cuddle. He does walk away after a bit if I ignore him. He will wonder to a crate and crash. They are soooo smart and learn how to manipulate you very quickly! I don’t know where you piggy sleeps, but I moved Elliot’s crate away from the morning sunlight (window view) and he sleeps later now! Maybe he doesn’t notice the sun is up until I’m up! I read all of your stuff & I feel like a horrible pig owner I have a mini pig named Leah , I got her when she was only 3 weeks old & she’s been with me now for almost 2 months . I’m with her always , & i think she is very spoiled But I like that she is in some ways. She does not sleep through the night though , she wakes up about 3-4 times to drink milk.. I wish to change that , But I don’t know how to say no She is potty trained and is sweet , and behaves well . But the sleeping schedule is pretty stressful. Hi Nashalee! You sound like a loving pig owner! I think we all feel like horrible pig owners from time to time. I know I sure do! I think some of the spoiling is okay (and I understand why you like it in some ways) unless it turns into the biting and head swiping and less desirable behaviors like that. We knew Oscar was spoiled for a long time and were fine with it, but once he started the more aggressive behaviors, we had to adjust. But, if Leah isn’t showing those aggressive behaviors, she’s probably just fine. Hi Shannon! Sorry you’re dealing with mange. Ugh, it’s not fun at all…for Magnum or for you. I recommend reading our post on mange treatments if you haven’t already, and that way you can see how we handled Oscar’s treatment. Our first time treating him didn’t “work” and we had to do a really extensive second treatment with injections and a long isolation period. One thing to keep in mind is that it can be really easy to get mange paranoia, so try not to panic too much when Magnum scratches. It’s possible that the treatment didn’t work, but it also took a while for Oscar’s mange to really go away and for him to heal and stop scratching completely. If it were me, I would have another skin scrape done when the treatment is finished so that you have a somewhat objective way (the tests aren’t perfect but are helpful) of telling if the mange is still there because it can get really easy to worry about every scratch. I feel for anyone dealing with mange because it’s tough. Someone once described it to me as feeling like you have lice in the house…this invisible thing that you don’t know if it’s still there or not and so it’s easy to get paranoid about it. Hopefully the treatment worked but, even if it didn’t, go back and try it again or do a longer isolation period. You will eventually get rid of it, and once it’s gone, you shouldn’t have to deal with it again unless you’re around other pigs who might have it. Keeping that in mind helped me so much when getting through Oscar’s mange. I’ll put the link below to our mange treatment post in case you haven’t read it. Hope it helps and that Magnum’s mange is gone! We just got Harley yesterday (she is 6 weeks) and she is sleeping a lot. I put her in her dog bed that I bought her for my office at work and she has been laying there all morning. It this okay? Hi Megan! Congrats on bringing home Harley! My guess is that she is just tired from the trip home and all of the excitement of everything new. If she isn’t moving around a little more by now, I would recommend taking her to the vet just to make sure everything is okay. But, I think she’ll start moving around and getting a little more energy as she gets more comfortable and starts to adjust. Hi ma’am I just got my Tammy a week ago and she is 2 weeks old the owner gave her to me at this young age I was wondering is there ways that I can calm her down or make her eat more since she seems sad that she isn’t with her mom and she bites a lot to would like to learn tips about how to reduce that . She also twitches a lot when she’s asleep is that bad ? Hi Jacqueline! Congrats on bringing Tammy home! Two weeks sure is young, but I’m guessing a lot of the behaviors you are seeing like the slow eating and the biting are due to her being scared and still getting to know her new family and new home. There are sometimes special diets for piglets that young, so I would make sure she’s getting everything she needs and a vet can help with that. Nutrition aside though, sometimes piglets at a new home for the first time take a while to start eating full meals while they’re still adjusting. Also, while biting should be taken seriously, I wouldn’t worry much about it until she’s more settled at home. I think she’s still scared and is just handling it in the only way she knows how. If she’s still biting once she’s settled and comfortable at home, you can look into Move the Pig, but I would just focus for now on getting her comfortable. Try not to rush the bonding and just sit with her for now. If she’s not comfortable being touched yet, that’s okay; just let her come to you when she’s ready. For the twitching in her sleep, it’s likely she’s just dreaming. Oscar’s nose and occasionally his body will twitch when he’s dreaming. If it’s more than that or it’s concerning, a vet can let you know if it’s something more serious. Hope that helps! I’m having a bit of an issue with my Peggy, sleeping. She wakes up several times a night to scratch all other, which is very noisey often making me move to the living room to sleep. We’ve had her less than a week. The people who owned her before didn’t care for her well. I would like some tips on her extremely dry skin and how to make her lose weight (they fed her whenever and whatever). Do you have an article you could possibly direct me to. TIA. Hi Hunter! Sorry for taking so long to respond. One thing you might check on Peggy’s scratching is to make sure she doesn’t have mange. It’s possible she’s just itchy from dry skin but, if she’s scratching that much, it might be good to take her to the vet for a skin scrape to just check mange off the list. Especially where she wasn’t cared for well by her previous owners, I would check to make sure mange isn’t what’s causing her scratching. For her dry skin, I recommend trying coconut oil treats, and I’ll link to our post on it below. It’s my favorite way of dealing with Oscar’s dry skin, but of course you can also use oils directly on Peggy’s skin as well. As for weight loss, we haven’t gone through that really with Oscar, so I’m not a great resource. However, I’ll link to a post that I recommend for a “proper” pellet diet that might help. Another great resource if you need more detailed information is the group “Mini Pig Education” on Facebook. It’s full of experienced owners who might have great diet plan info for pigs. Hope that helps! I put coconut oil in Elliot’s food, he LOVES it. I do it for my dogs too. He never scratches anymore. Hey! We recently added a mini to our family this past sunday. He was born 8/28. We were told he had been around people and was pad trained. We soon found out he does not like people right now and is not pad trained at all. He actually likes to tear the pads up. He doesn’t like to be held or touched and we havent put a leash or harness on him because he gets all upset (upset is a nice way to put it) when we catch him and attempt to put his harness thing on. We were told it takes a while for pigs to trust humans but my carpet is now ruined, he roams freely in my home, doesnt like a crate, and i feel like a bad piggy mom. Help! How can we get him to trust us and do you recommend just “being the parent” and putting the harness on him and putting him in the crate at night even when hes screaming as loud as he can? Hi Jennifer! The time before your pig is bonded with and trusts you is one of the hardest because you’re getting a lot of the work without a lot of the benefit. As for getting him to trust you, it really does just take time. It will likely feel as if you’re not making progress, but you will if you keep at it. What I would recommend is starting over with him just like I would recommend to anyone bringing a new piglet home. So, I would confine him to a small room, like a bathroom, using a baby gate or something similar. This will help with giving him a safe space and with potty training. When you can, go into the room with him and just sit. If he doesn’t want to be touched yet, that’s ok. Just sit near him and let him know you’re there and it’s safe for him to be near you. Try not to rush the bond and just let him come to you in his own time. As far as “being the parent,” it’s a tricky line. On one hand, you want him to learn to trust you but, on the other hand, he needs to learn the rules. We started putting Oscar’s harness on from day one because we had to to take him outside to potty (he’s not litter box trained). We used treats to distract him while putting the harness on and that helped, but it was not fun training him to put his harness on (screaming at the top of his lungs, scared, etc). Some people prefer to wait a while before dealing with the harness, so it kind of depends on what you prefer. If you need to use the harness, then start it now and just keep at it until he finally gets used to it (he will; I promise!). If you don’t, then maybe you can wait a little while until he’s more adjusted to home. However, as far as screaming at night, I would do my best to train him in that area. Unless you’re worried about him or he needs to potty or something like that, I would put him in his bed and leave him there through the night. Some people give in and get up to give their pigs attention or food, and in my opinion that sets your training back by teaching them to scream at night to get what they want. Is he neutered? Could be marking his territory if not. Drinking to much water or eating to many greens? I read that sometimes they go backwards until they are older. I make sure Elliot goes on his wee wee pad or outside right before bed. When I do that – he never has an accident. Hi, I was wondering about two things. I just got my first pig two days ago, he is only 5 weeks old and we have been told to feed him 1/4 cup of food am and one in the pm before bed. He is fine eating it during meal times but I’m worried he has eaten to fast. After his meal time he actually threw up, but his diet hasn’t changed from the breeder to us. It’s stayed powdered goats milk with a few cheerios. Is he eating to fast? Or should we split the two 1/4 cup a day into four 1/8 cup feedings throughout the day so it’s not so much on his belly right now? Also is it normal for him to shiver? He tends to shiver as if he is cold but our house constantly stays at 71 and he had multiple blankets and stuffed animals inside his bed. Should we add a heating pad on low? I am an experienced mini pig owner. I previously was a breeder. After selling my entire stock, i felt a missing piece at home and decided to get a baby back in the house with me. I am not experiencing something I have never experienced before. My piglet is waking up (all hours of the day/night) in what seems to be night terrors. She jumps up and starts running around freaking out. Her terrors only last about a minute, but I’m concerned because I don’t know what is wrong. I have done my research and tried talking to vet. No one in my area really has any answers for me. Any advice or information would be greatly appreciated. Correction on previous post….I am NOW experiencing something I have never experienced before. I’ve had My pig (lylabell) for about 8 months and we where doing fine and the past week she has been digging and getting out of her cage by herself and I haven’t gotten any sleep. this is very common when you first bring home a pig. Keep in mind, he is very distraught that he was taken away from his momma and now put in a cage. so yes, she wants to be with someone… that is what I did with our pig, he came home at 9 weeks old. my daughter’s pig… said she would take care of it. after the 3rd day, she said I havent slept in 3 days… I then took the bed and put it in bed with me… it slept in my arms every night until he got too big. haha It will take time for him to get acclimated to his sleeping quarters if you choose not to let the the pig sleep with you. Have patience… they are wonderful pets. my mini pig is about 12 weeks. we are having issues with him wanting to go to sleep. for awhile we had a schedule down and he would complain when about 9pm hit so i knew it was time for be and he would go with no issues. well the past 4 days i would put him in his crate at 9 and he would sit there and scream and jump around and scream some more. so i would take him out after a while of him screaming let him fall asleep in my arms and then i would put him back in his crate and he would scream some more( he would fall asleep immediately in my arms) . so then i end up falling asleep with him in my bed and then once he wakes up randomly in the night i would put him back in his crate and he would then finally sleep.. what would your suggestions be? Noah will be seven years old in September. He came to us when he was nine weeks old. He was up alot during the day but slept through the night in bed with me until he reached the 98 lb mark and then my hubby said I am not carrying him up and down the steps anymore…I get it… it became to dangerous for the pig… haha and yes my hubby too. Noah is now 165 lbs. Dr said he needs to lose 15 lbs. Vietnamese Mini Pot Belly Pig should be 150 lbs. Noah eat mazuri elder pig food and gets his celery and sometimes table scraps once in a great while. He wakes up around 830 am, eats 1 cup of food then goes outside and enjoys the weather, drinks water, takes care of business. then comes back in and take a long nap for four to five hours, gets back up … eats around 5pm and sometimes goes back out if he wants.